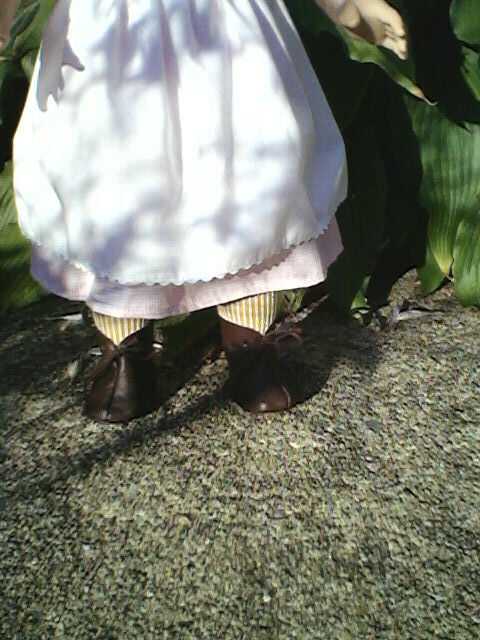 Tea Time with Melody Q: Favorite Outfits & 100th Post! Key for the following conversation. Did you see the invitation? Yes, I'm really looking forward to the spectacular! Hey, I can't find my socks. Has anyone seen them? They're over here, Kirsten. Catch! I'm glad I packed this...and that it didn't wrinkle. Looks great, Kaya! You always take such good care of your regalia. Has anyone seen my purse? I had a hard time deciding, but for today this is my favorite (another will be shown later in the week). Someday I hope to attend a real lu'au. The ones I've seen on TV and in movies look like a lot of fun. This is such a great summer outfit. The purple top matches the double-layered, peplum auana skirt. Add the pink floral head wreath and lei...done. Oops! don't forget the 'uli 'uli gourd. 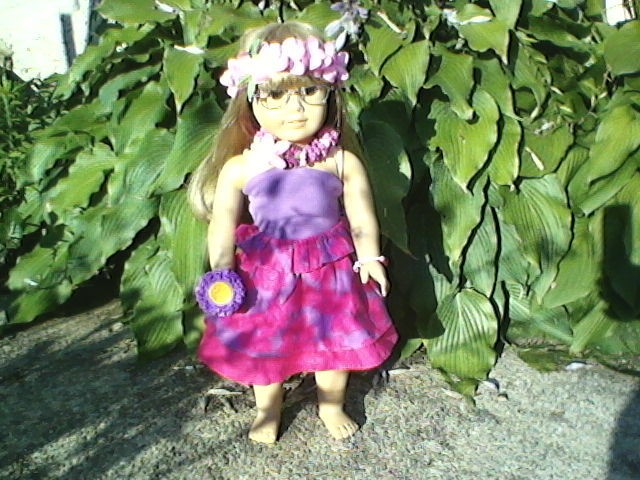 This outfit was only available in 2011 when Kanani Akina was American Girl of the Year. I love the bright white suede and the red, brown, and yellow detailing. 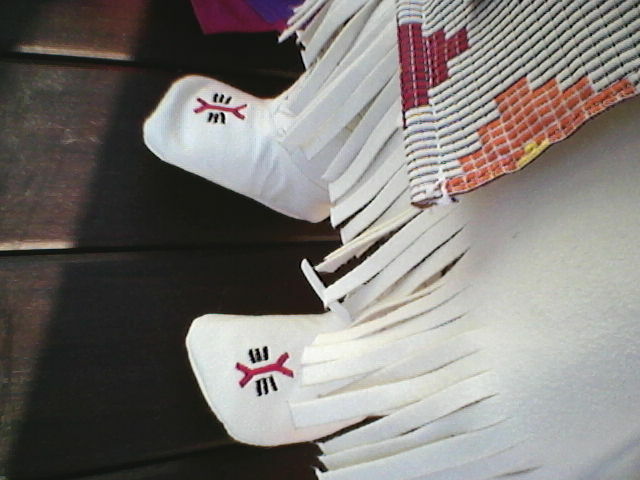 Like my other outfits it has matching moccasins. The belt and head piece match as well. I'm still wearing my princess tiara from last week's contest too. I like the added touch it brings. 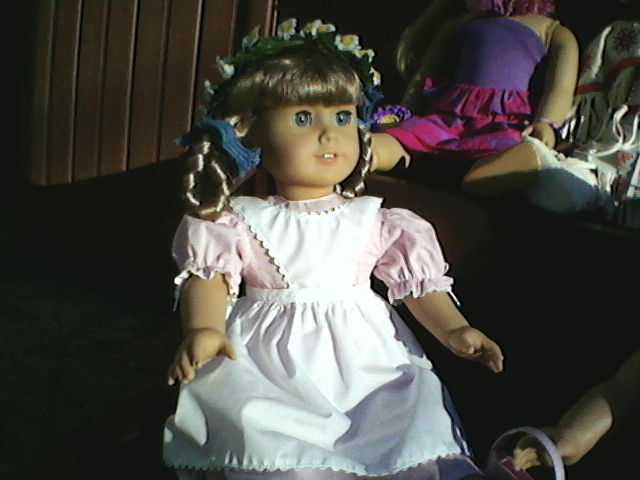 This outfit was introduced in 2005 and retired in 2011. 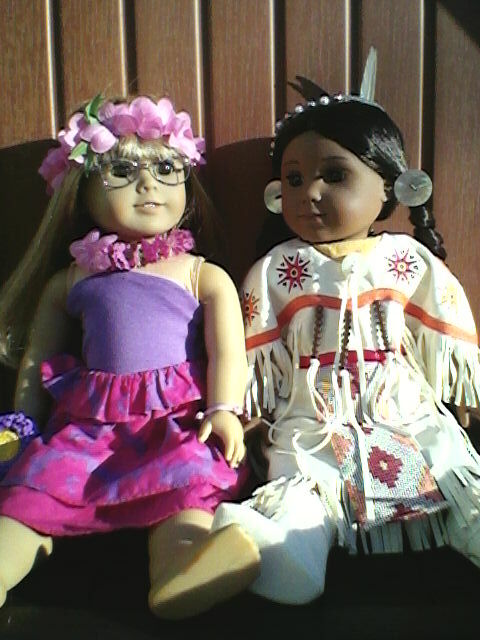 I wore the The Pow Wow Dress of Today 2 outfit for In The Castle week. 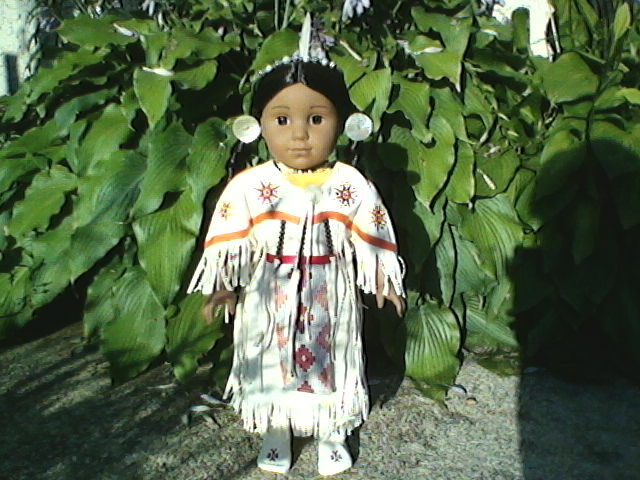 If this were true Traditional Dance regalia, it would include a fan and shawl. However, we're going to let that bit pass. If you are interested in Pow Wows please do your research before visiting as you do not want to offend your hosts by accidentally insulting their cutlure. 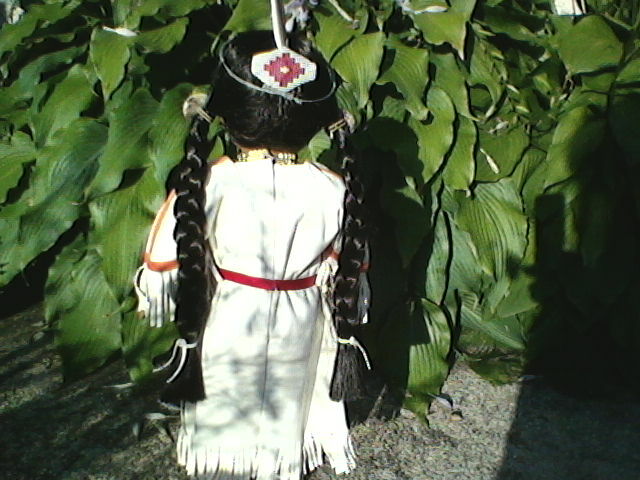 I found some great sites for you: Pow Wows, Etiquette (though this is really for dancers, but make sure you know this as well especially with regards to seating), Regalia, Dances. This is my favorite outfit, especially for warmer days. It is crisp, clean, light, and fun! And a daisy wreath for my head...it makes me feel like a princess. 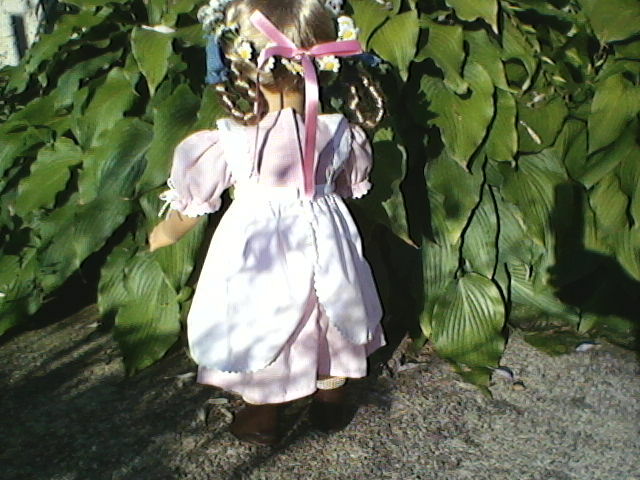 The dress is pink with short, puffy sleeves and white bows. Over that I have a lovely white apron. The tan socks are cotton not wool! 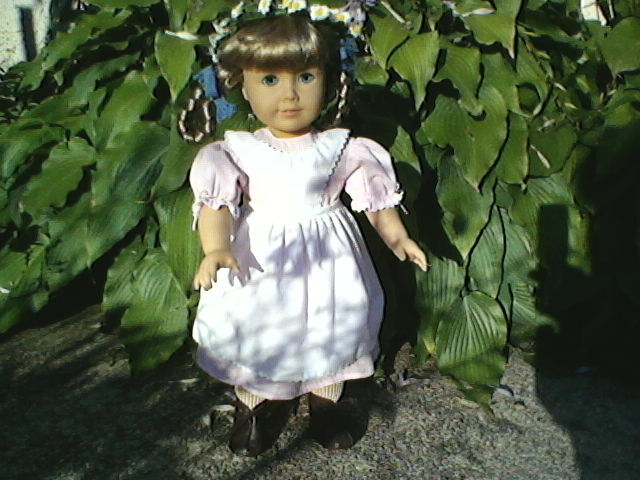 This outfit was available from 1987 - 2009. It is featured in the book Happy Birthday, Kirsten! The only thing that would make this outfit better is if it were "Lulu's Best Friend Outfit." Licorice is my favorite of all our cats. The dress is pink and darker pink. It has a dual hem and is bedazzled with a flower on the bodice and jewels at the hem. Today, I complete the look with matching pink, beaded, slip-on sandals and a pink purse. The purse has Licorice's picture on it. There is a white jean jacket that goes with it, but it's too hot for that in the summer. This outfit was released in 2005 and retired in 2007. So how do we look? Have a great day and come back again soon. Ps. 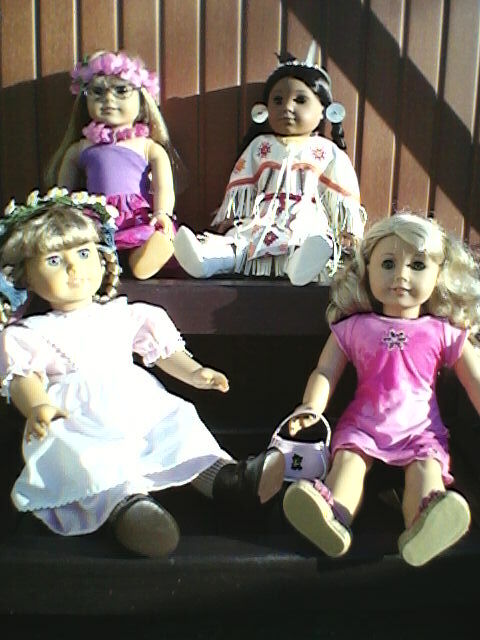 Camp Doll Diaries Week 9 Theme is Around the Globe. We've learned about Punch & Judy from England and made a Japanese hair clip. Congrats on 100 posts! My favorite outfit is Kaya's Outfit, but they are all so pretty. Camp: Hot, but Still Fun!